Deliciously simple, with a lemon herb butter sauce, and cooked on the grill or in the oven. In a medium bowl, combine softened butter, chives, parsley, garlic and lemon zest. Slice the lemon into ¼” slices Set aside. Thoroughly clean shrimp and devein (pull out the small vein on the back). (For ease of eating, you can buy the shrimp with the tails already removed, or leave them on). Cut four large pieces of foil and stack. 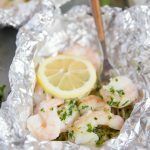 Add half of the shrimp to the center of one piece of foil, then top with half of the butter mixture and 2 lemon slices. Using two pieces of the foil, fold into a packet and close tightly so you have a nice, secure foil pouch. GRILL: Heat your grill to medium-high and place foil packets on the heated grill. Cook for about 8 minutes, or until shrimp is bright pink in color. OVEN: Preheat oven to 350 degrees F. Place packets on a baking sheet and bake in the oven for 10-12 minutes. *For the oven baked method, you could easily get away with just using one layer of foil per packet. Open carefully and serve immediately. These foil pack shrimp are delicious with pasta or rice, and especially with our homemade fettuccine alfredo.